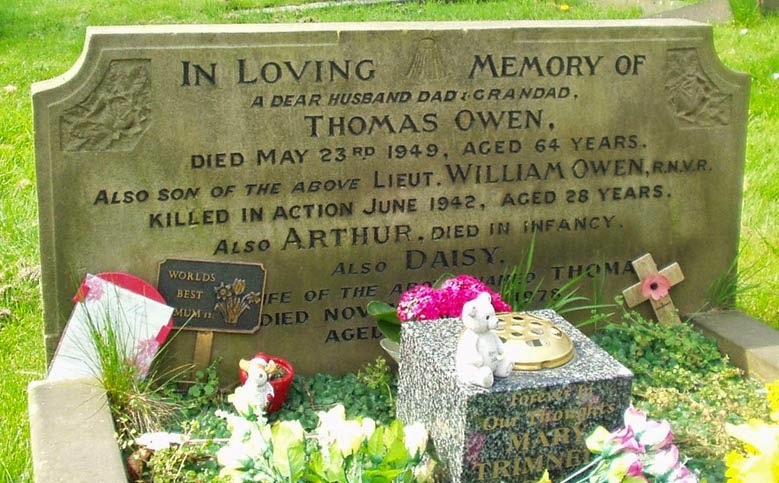 In Loving Memory of / A dear Husband, Dad & Grandad / Thomas Owen / Died May 23rd 1949, aged 64 years / Also son of the above Lieut. William Owen, R.N.V.R. / Killed in Action June 1942, Aged 28 years / Also Arthur, died in Infancy / Also Daisy / Wife of the above named Thomas / Died November 4th 1978 / Aged 84 years. William is also remembered on the Hoyland War Memorial, West Street and Kirk Balk, Hoyland, the Barnsley, Holgate Grammar School Old Boys - WW2 Memorial Plaque and is buried in the Port of Spain (St James) Military Cemetery in Trinidad and Tobago.